If you follow us on Instagram or read our Recent Things post yesterday, you may have noticed that this girl has a soup obsession at the moment. The weather starts getting colder and all of a sudden the only foods on my mind are soup, steaming hot bowls of oatmeal and hot tea, hot chocolates, coffee and vanilla steamers. But that's not such a bad thing when it means I get to eat all of those delicious warm and comforting foods and drink all of those delicious warm drinks - and it means I get to share the recipes with you too! This is a soup I've been making year after year, batch after batch since my coeliac diagnosis. You see, along with finding out that I couldn't eat gluten, I also found out that I had a million and one other intolerances so most soups and stocks were no longer an option for me. 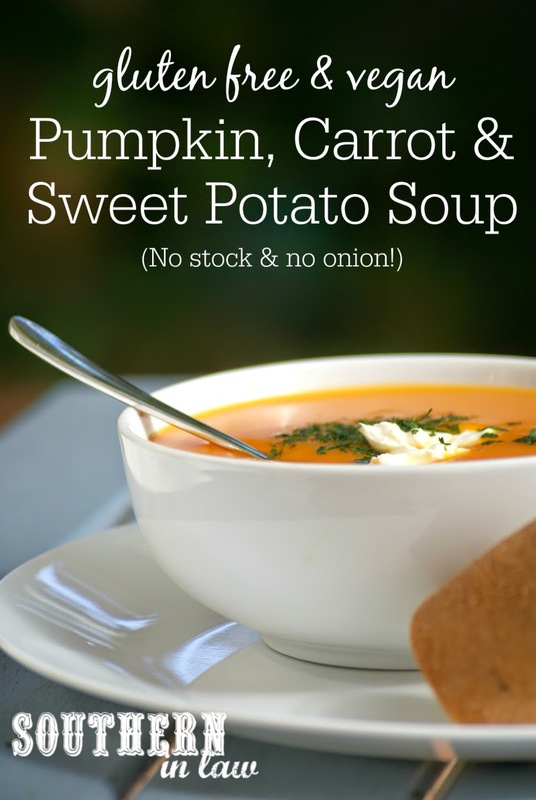 Most soup recipes call for stock, however, as someone who couldn't eat onion or celery and a bunch of other classic stock ingredients, I had to improvise - and through improvising I came up with the best soup recipe that's casually known as "Orange Vegetable Soup" in our house... I wonder if you can guess why? 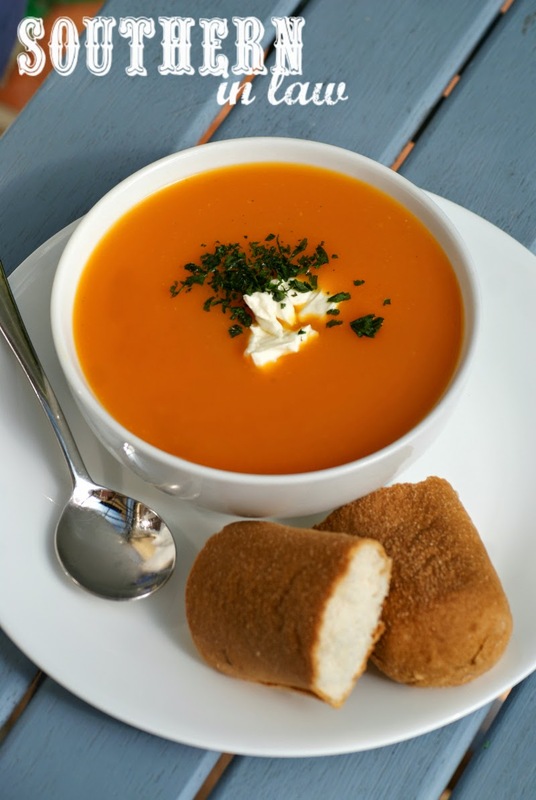 With carrot, pumpkin and sweet potato this is a soup recipe that will probably completely exceed your beta carotene quotas for the day - but a delicious soup nonetheless. Jesse and I have been enjoying it for lunch in a thermos whenever we're out and about working during the day and it's the perfect pick-me-up in the middle of a busy day. ~1 tbsp each chopped basil and parsley. Place all of your ingredients into a medium-large saucepan over a medium-high heat. Bring to the boil and cover, reducing to a simmer. Simmer until your veggies have soften and then blend, adding the cornstarch and returning the soup to your saucepan to heat and thicken as needed. Just before serving, stir through your fresh herbs and season to taste. Serve hot, garnished with a dollop of greek yogurt or cream or additional fresh herbs if desired. Place all of your ingredients into your Cuisine Companion, fitted with the ultrablade. Turn on the P1 Soup Function for 40 minutes. Once your soup has gone through the cycle, season to taste and add cornstarch if desired to thicken the soup and turn onto the P2 soup function for 10 minutes if needed to further heat and thicken your soup. Stir through your fresh herbs and serve hot, garnished with a dollop of greek yogurt or cream or additional fresh herbs if desired. I usually make up a batch in the Cuisine Companion whilst I'm working from home, eat a serving for lunch and keep the rest in the fridge in an airtight container. The soup will keep for up to a week in the fridge and also freezes really well. But tell me, what foods do you crave in cooler weather? And what's your favourite kind of soup? This sounds super good! I love love LOVE sweet potatoes and carrots and I bet the butternut squash makes it even creamier. 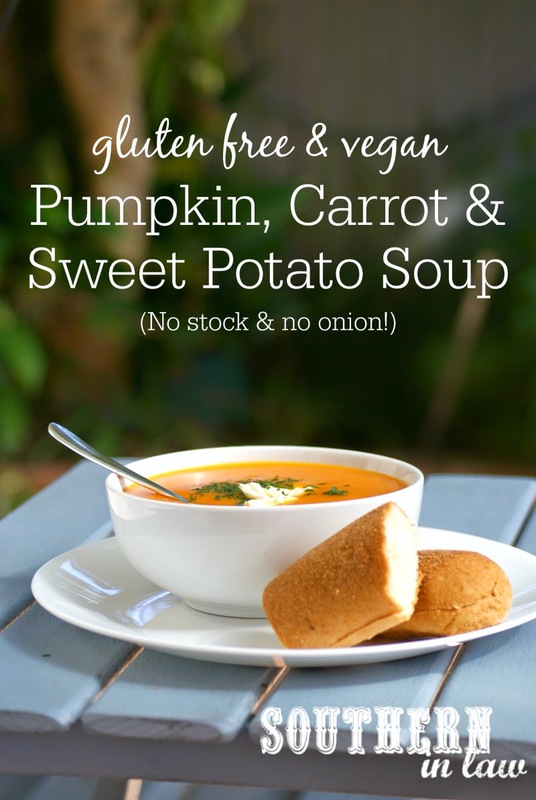 It is definitely the perfect combination of some of the best veggies!